The Gambart Baines Challenge Cup, first won by Mr Zena Smith from Cleckheaton in 1919 is still proving to be popular nearly a hundred years later. 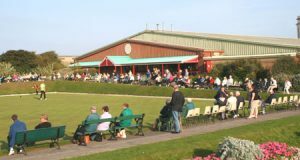 This annual competition played on two crown greens in Alexandra Gardens, part of the Scarborough Bowls Centre, attracts competitors from all over Britain.The competition is organised and managed by volunteers from the nine clubs who make up the Scarborough and District Crown Green Bowling Association. The final takes place in August when a minimum of 32 qualifiers compete for the magnificent Gambart Baines Cup. Gambart Baines (1858-1920) Ernest Gambart Baines, was born in 1858, the son of Clementina Baines, who owned a waxworks, which toured in both England and France with Madam Tussaud. Originally brought up in Newcastle, he moved to Leeds from where he, like his mother, operated a touring waxworks. He moved to Scarborough in the early 1900’s and ran the Gambart Waxworks exhibition in Scarborough from 1904. One of his interest was Crown Green Bowling and he was associated with the Pavilion Bowling Tournament for many years and gave considerable support to the Scarborough Bowling Tournament. The handsome Challenge Cup which is used today was first presented by Ernest Gambart Baines in 1919. He was a staunch Conservative and represented Scarborough’s Central Ward from 1917 until his death in 1920. He was a generous benefactor and presented the town with its first motor fire engine, named Jessie after his wife. He also gave Scarborough the Foreshore water fountain as well as supporting Christ Church by providing prayer books.